We've had some hot, sweltering days lately and it's been nice to have my freezer stocked up with a few homemade ice cream flavors. The beauty of making homemade ice cream is that I know exactly what's in the ice cream and there's always the fun of making whatever flavor we want. I came across a great ice cream recipe on one of my favorite blogs, One Perfect Bite. 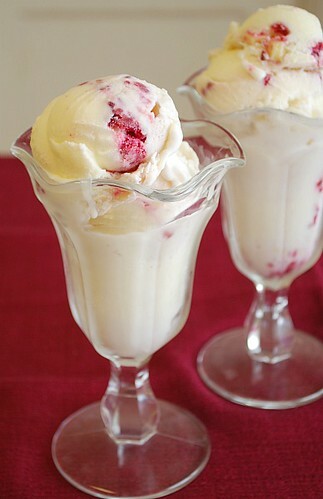 This White Chocolate Raspberry Ice Cream combines white chocolate morsels and a fresh raspberry puree. It's a great flavor profile with a bit of texture and it's easy to make! This recipe is one that requires making a custard ice cream base. Although it takes more time, the results are definitely worth it. The texture is smooth and creamy with a swirl of fruity raspberries and bits of white chocolate. Next time, I'll double the puree and use some of it as an ice cream or dessert topping... it's that good! To prepare ice cream: Place the white chocolate in a large bowl and set aside. Meanwhile, combine whole milk and heavy cream in a medium pan set over moderate heat. Bring to a boil and then carefully pour the mixture into the bowl containing white chocolate, stirring until smooth. Set aside and allow to cool slightly. Meanwhile, in another medium bowl, combine sugar, whole eggs, and egg yolk. With a hand mixer, beat the mixture until it becomes slightly thick and whipped. Stir in vanilla extract. Slowly beat 1 cup of the warm white chocolate/cream into the whipped egg mixture to temper. Add the remainder of warm white chocolate/cream mixture. Transfer the combined mixtured to a medium saucepan and cook mixture over low heat, stirring constantly, until mixture begins to thicken and coats back of a spoon. Transfer mixture to a bowl. Cover with plastic wrap and refrigerate for 6-8 hours or overnight until completely cooled. To prepare raspberry puree: Combine raspberries and sugar in bowl of a food processor or blender. Process until smooth. Strain seeds from raspberry puree. Cover and refrigerate. To make ice cream: Pour chilled ice cream mixture into your ice cream freezer bowl and process according to your manufacturer's directions. Once finished, spread 1/3 of ice cream mixture into a shallow pan. Top with half of the pureed raspberry mixture. Add another 1/3 of ice cream and top with remainder of raspberry puree. Top with the last of ice cream mixture. Cover with plastic wrap and return to freezer. Freeze until firm, about 1 to 2 hours, or longer to allow flavors to meld. Uh oh another ice cream recipe to add to my list! This looks amazing and different from many of the other ice cream's I've seen all over blog world. Thanks for sharing! I would love to start making Ice cream. I can think of lots of flavors that would be good! I made a raspberry and white chocolate ice cream recently but it was completely different to this one so I look forward to giving it a try. I''m always looking for new ice cream ideas at the moment. I haven't made ice cream yet but i can certainly appreciate the fact that its so much better to know exactly what you are eating plus it looks so delicious! Oh my, white chocolate and raspberry sounds amazing! I love homemade ice cream, it is so much better than store bought I don't know why I don't make it more frequently! My husband would love this, I should give it a try. Love that flavor combination! My oldest would be thrilled if I made this one for him... first I need to get an ice cream maker! Add some dark chocolate truffles pieces to this and it would taste just like Haagen Daz!